1. Prep, prime, and conceal. As with your face, eye makeup too starts with a good base. 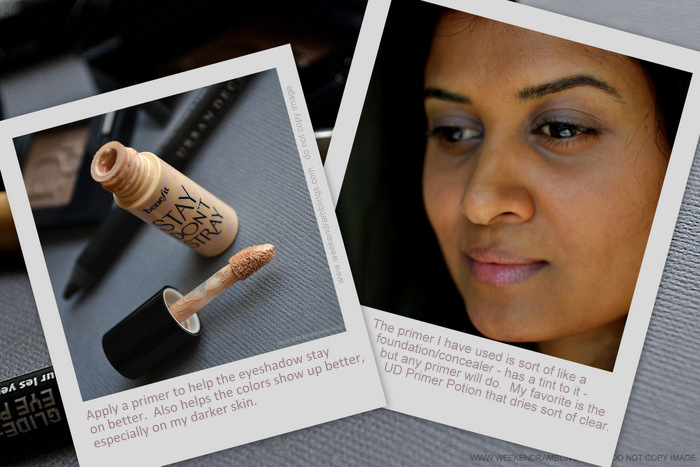 You can use a foundation and/or concealer to even out any skin discolorations around the eye/eyelid. I have darker eyelids, but I prefer to let the natural darkness show through rather than cover that up since I do go for darker eye makeup most of the time. If you are using paler eyeshadows or lighter colors, you might want to cover this up. 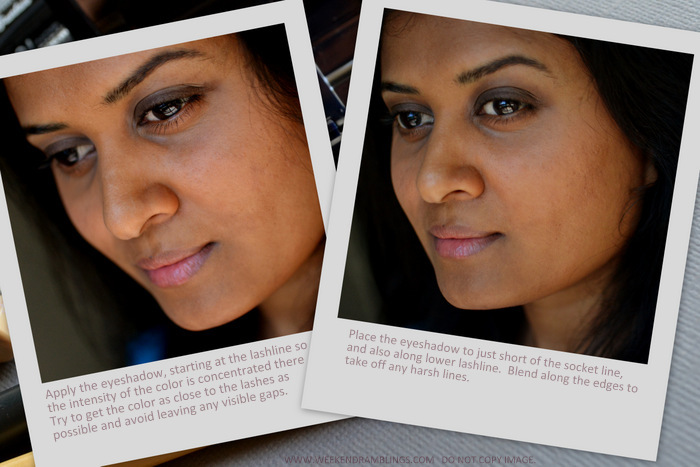 Follow with a good primer that will help keep the eye shadow looking vibrant and help them stay in place the entire day. 2. Picking the right eyeshadow. My idea of a daytime eye involves using a brown-khaki-taupe sort of neutralish color. I prefer matte eyeshadows or those with very fine shimmer and/or a satin finish. Glitter/larger chunky shimmer is a big no-no for me. This is, of course, just personal preference, because ultimately, I do believe makeup with a ton of rules is no fun! Anyway, pick your shadow - whichever it is that you wish to use for the day, preferably something that has a bit of lasting power. 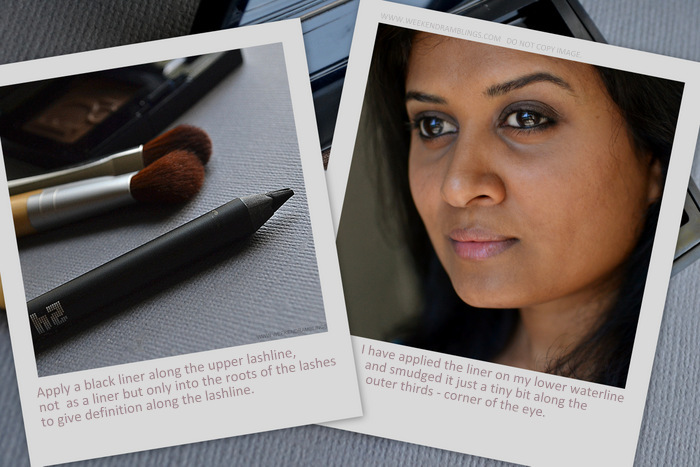 Since this is a very basic eye makeup application, I have used only on brush - the TBS shadow blending brush. Something similar to the ever popular MAC 217 (which I do not own) would be ideal as it would help place the eyeshadow as well as do a quick blending around the edges. 3. Applying the eyeshadow. An easy daytime eye is a soft wash of color over the eyelids that fades out along the socket line. Start with placing the shadow along the lash line to give the maximum intensity/darkness near the lashes and apply the shadow over the entire lid, stopping short of the crease. Use the fluffier edge of the brush to buff and blend the edge of the eye shadow along the socket line so there is only a haze of color there. Apply the same color along the lower lashline - if it's a darker, more pigmented shade stick to the outer thirds of the eye - and again, blend it softly so there are no harsh lines. 4. Eyeliner. I like a bit of definition along the lashline, and a darker/black eyeliner helps with this. Apply the eyeliner along the roots of the lashes (lift up the eyelid gently using a finger and just push the tip of the liner along the base of the lashes). It won't really be seen as a line, but it will add a bit of darkness along the lashes. I also use the eyeliner on my waterline on most days. 5. Finish with curled lashes and some mascara. I like to have really natural mascara application and the easiest way to get clump-free, feather lashes (apart from applying the mascara properly - which I can't seem to especially if I am in a hurry) is to use a lash comb. This is a very inexpensive, easily available, and often overlooked makeup accessory that is an essential for me! Apply the mascara starting at the roots of the lashes and in zig-zag motions through the lashes. Comb through with the lash comb to take off any excess product and to separate the lashes. And that's my easy day time eye makeup routine. Just changing the color of the eyeshadow is more than sufficient to change the look. this is an old LE shade right ? Yes, I do prefer softer shades - is just easier to carry off for someone like me (don't do a perfect base makeup) :D I don't know if it's a discontinued shade..I got it from the NARS website...ooh Flamenco looks like such a yummmy shade!!! Subtle and awesome at the same time.. Love it !